Give God your whispering thoughts. Throughout the centuries, people have learned the value of brief sentence prayers. These Give God your whispering thoughts. These are prayers that can be whispered anywhere, in any setting. Frank Laubach sought unbroken communion with God by asking Him questions. Every two or three minutes he would pray, ‘Am I in your will, Lord? Am I pleasing you, Lord?’ Imagine considering every moment as a potential time of communion with God. By the time your life is over, you will have spent six months at traffic lights, eight months opening junk mail, a year and a half looking for lost stuff, and a whopping five years standing waiting in various lines. Why don’t you give these moments to God? By giving Him your whispering thoughts, the common becomes uncommon. Simple phrases such as ‘Thank You, Father,’ or ‘I stand on Your Word,’ or ‘My desire is to please You,’ can turn a commute into a pilgrimage. You needn’t leave your office or kneel in your kitchen. Just pray where you are. Let the kitchen become a cathedral and the classroom a chapel. Give God your waning thoughts. At the end of the day, let your mind settle on Him. Conclude the day as you began it—talking to God. Thank Him for the good parts. Question Him about the hard parts. Seek His mercy. Seek His strength. As you close your eyes, take assurance in the promise. If you fall asleep as you pray, don’t worry. What better place to doze off than in the arms of your Father? Dios en nuestra vida es el mejor medio de vivir en paz y transmitirla a los demás. El es la fuente de la felicidad. Aunque estemos en dificultades, El nunca falla. Sigamos orando a través del día con esa plena seguridad que El siempre nos escucha. I just wanted to than whoever wrote this piece. It is profoundly powerful yet simple advice and I have had this as a living part of my spiritual relationship with God since I was a child. I always knew I could rest in Him no matter what else is going on. Blessings on your day. I accord with Priscilla. As my financial situation is getting a very bad one I intensify my prayers but don’t get any answer. 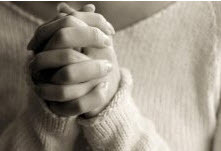 I will try now with these short whispered prayers and hope to get an answer from the Father.